While the Hyundai Xcent compact sedan is facing the heat from the latest generations of the Maruti Suzuki Dzire and the Honda Amaze, it’s still a pretty well-sorted model that has enough going for it. Hyundai Motor India Ltd (HMIL) even sells a set of official accessories that can help you make the compact sedan even more appealing. Below is a video that details the official accessories for the Hyundai Xcent. The vlogger has used a white-coloured Xcent to demonstrate the accessories on offer. For the car’s front-end, you get chrome garnish for the grille, which costs Rs. 5,517. You can’t install fog lamps on the base variant of the Xcent as the entry-level model doesn’t’ come with the wiring for the same. However, you can replace the damaged fog lamps of higher variants for Rs. 7,134. For the side profile, you can purchase a set of wheel covers for Rs. 3,600 or a set of alloy wheels for Rs. 36,000. You can also install a set of mud flaps for Rs. 347, while a set of side rub strips costs Rs. 1,100. Door visors can be bought for Rs. 1,319. At the rear, you can install a boot spoiler for Rs. 9,735. For the interior, you can purchase a cushion set for Rs. 1,300. Hyundai also sells non-illuminated scuff plates for Rs. 670. The seat covers cost Rs. 7,500, while the driver back-rest has been priced at Rs. 800. Floor mats cost Rs. 942. A mechanical gear lock device can be added for Rs. 1,648. 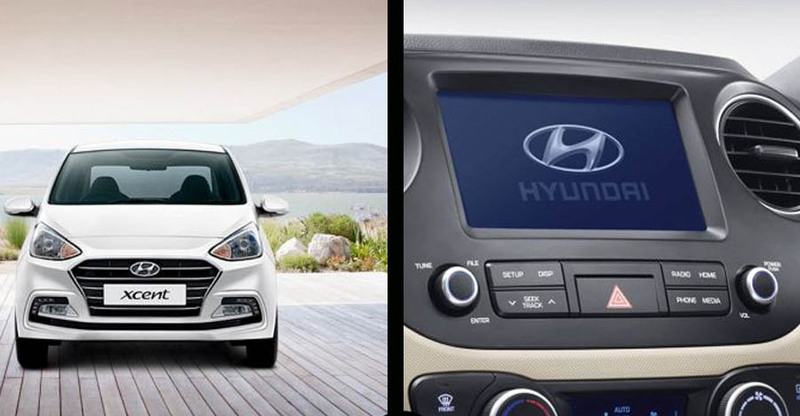 Hyundai also offers a 2-DIN music system for the lower variants, which costs Rs. 13,786. A touchscreen infotainment unit costs approximately Rs. 23,000. You can also purchase other minor accessories like a steering wheel cover and a mini dustbin. All these accessories can be purchased from the official dealer and installing them doesn’t affect the warranty in any way.